I assume that this is not how it is supposed to be. If I leave any of the options out, it will either result in an immediate kernel panic or a loading screen with the HackintoshZone logo and a progress bar loading extremely slow and stopping at ca. 50%. What can I do to omit the parameters or at least apply them automatically without having to type them every time? Regarding my graphics driver, do I really need it? My screen resolution is fine. I did not change any settings in the image, so I assume it is still the default one in the Yosemite Zone DMG Image (Chameleon). UPDATE: I have formatted my USB drive and re-copied the image and double-checked some BIOS settings. For some reason, I could perform the installation without any boot flags now and installation succeeded without the "Undefined Error 0". Nevertheless I still can't boot the OS in normal mode because I'm stuck at the HZ loading screen and after 20-30 min the screen signal turns off. I also tried with dart=0 -f which results in a kernel panic. UPDATE 2: I have managed to make it work with GraphicsEnabler=N -f by unplugging my USB wifi antenna (but that is no problem as it is not compatible with OSX anyway) but booting is very slow (takes about 2 minutes). What can I do to speed things up? 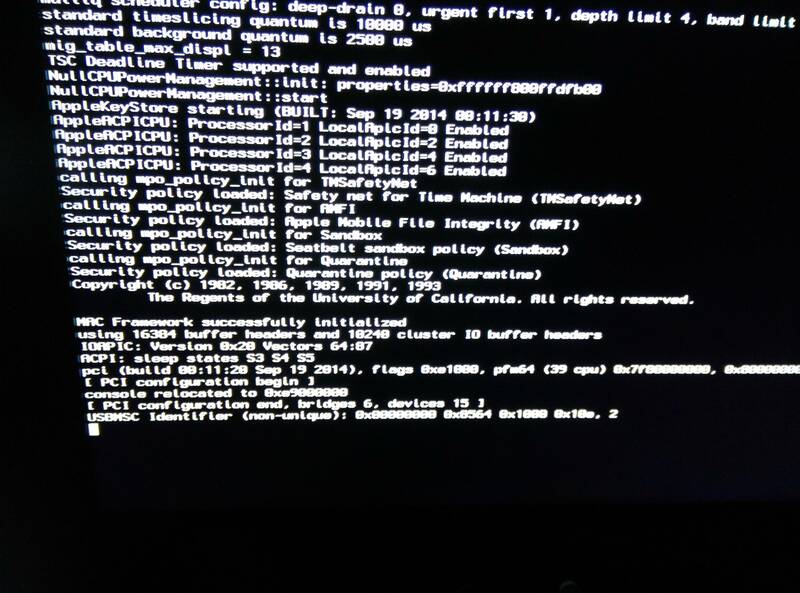 EDIT: Now it takes 40 seconds from pressing Enter on the boot screen until login screen appears, can this be optimized further or is this a normal boot time (without SSD)? I read something about deleting unnecessary kexts but am not completely sure what I can delete without breaking my system.